Wilbur Curtis D500 - Percasso Coffee & Bottled Water Service, Inc. Pair the Wilbur Curtis D500 Brewer with our locally roasted coffee for fantastic, consistent flavor…every time. With the Wilbur Curtis D500 coffee brewing System, there’s no need for complex brewing adjustments. This enhanced design system combines renowned Curtis brewing expertise with the latest in digital technology. 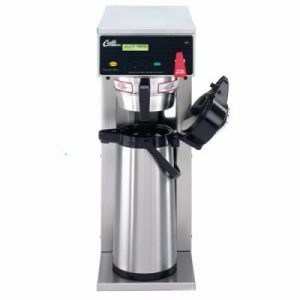 We program the coffee brewer for pulse brewing which provides total control over brewing time, turbulence, temperature and volume – the critical aspects of brewing quality gourmet coffee. The D500 coffee brewer system is beautifully styled with a classic stainless steel finish. It offers big performance yet takes up little space. It fits in spaces that are at least 9.5 inches wide and have a minimum over head clearance of about 25 inches. The generous brew cone clearance accommodates 2.2 liter (72 ounce) glass-lined air pots.